I was sitting in my chair one evening and looking at that basket full of left over yarn from all my Christmas projects and just started making little 2 row granny squares. Now in Feb. they have turned into a wonderful baby blanket. I don’t even know anyone having a baby. But after the grannies I still had some really little bits of yarn left and it turned into about 100 crochet yo-yo’s. Next I have to figure what to do with those. I can’t sit down without a crochet hook in my hand. I think I need a t-shirt that says that. 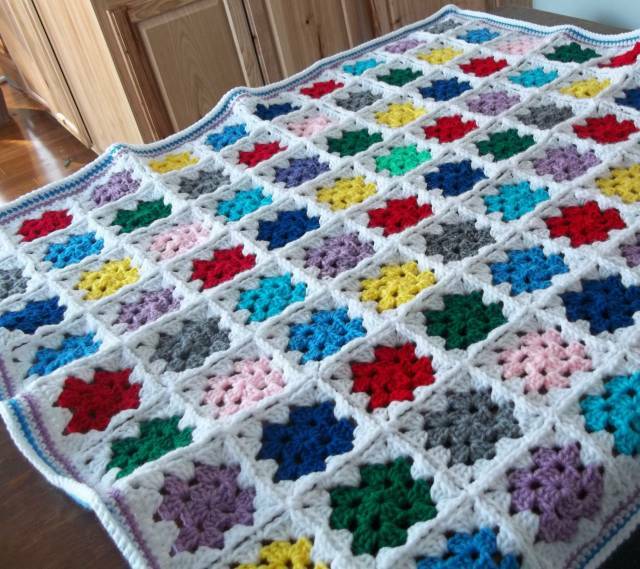 Here is the finished baby blanket. Next up a rag rug. Beautiful just beautiful! Gives me a great idea for my left over yarn! Absolutely lovely!! A great way to use up scrap yarn! Thanks. It is a great way to use all those little balls of left over yarn.